Be the first to share your favorite memory, photo or story of Monteena. This memorial page is dedicated for family, friends and future generations to celebrate the life of their loved one. Monteena Blanch Davis, 78 departed this life on March 27, 2019 at SOVAH Health Danville, VA. She peacefully made her final journey to be with our savior Jesus Christ. Monteena was affectionately known to many as “Mama Tina” or “NaNa”. She was born January 5, 1941 in Danville, VA to the late Willie H. James and Dorothy N. James. Monteena attended Langston High School and was employed at Danville Golf Club for 25 years. Monteena of Danville, VA. leaves to cherish fond memories one devoted daughter, Constance Anderson of Danville, VA., two devoted sons; Jermaine Davis Sr. (Katina) of Danville, Va. and Carnell James (Caron) of Lawrenceville Georgia. Mrs. Davis was preceded by a son Barry Anderson and two brothers; Willie T. James and Morrell C. James. Funeral services will be held at 2 p.m. Thursday, April 4, 2019 at White Rock Baptist church, 418 Locust Ln. Danville, VA with Rev. Dr. Walter M. Tinsley officiating. Interment will follow at Floral Hills Cemetery Danville, VA. at other times family the will be receiving at 334 Guilford St. Danville, VA.
Norris Funeral Services, Inc. & Crematory, Mt. Hermon Chapel, 3995 Franklin Tpke., Danville, Va. is respectfully serving the family. Online condolences may be made at www.norrisfuneral.com. To send flowers or a remembrance gift to the family of Monteena Blanch Davis, please visit our Tribute Store. 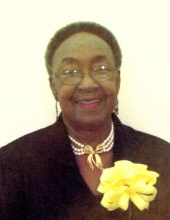 "Email Address" would like to share the life celebration of Monteena Blanch Davis. Click on the "link" to go to share a favorite memory or leave a condolence message for the family.